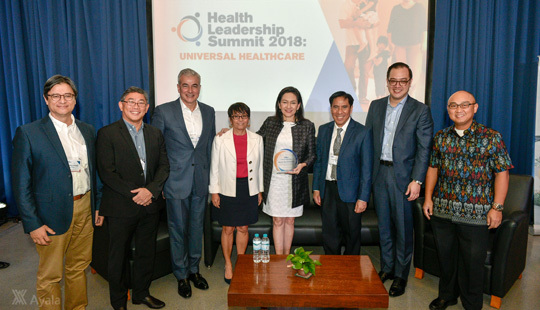 Over 400 participants from the government, private sector, academe, and non-government organizations joined the first-ever Health Leadership Summit held on December 3, 2018 at the Ateneo Professional Schools Auditorium in Rockwell, Makati City. The conference, organized by AC Health and the Ateneo Professional Schools, engaged participants in multi-sectoral discussions on key pillars of the Universal Health Care (UHC) Bill. Industry leaders were invited to share their expertise and experience in panel discussions covering Health Financing, Service Delivery Network, and Patient Health-Seeking Behavior. AC Health Board Chairman and Ayala Corporation President, Fernando Zobel de Ayala, in his opening remarks, stressed the importance of collective effort in bridging the gap in the healthcare system. “We believe that the success of UHC will come from a confluence of different stakeholders, working together to deliver services across the continuum of care,” he added. Senator Risa Hontiveros, co-author of the UHC Bill, was the event’s keynote speaker. Hontiveros provided updates from the recent passage of the bill by the bicameral committee, including the automatic enrollment of all Filipinos to PhilHealth, and improvement of access to various healthcare services, among others. “The idea behind universal healthcare is not simply coverage for all people for everything. It does aim to provide the most affordable quality healthcare possible for all Filipinos while installing a form protection from financial risk,” Hontiveros stressed. The summit discussions will be used to generate a policy paper that will provide lawmakers with timely input in the final stages of the passage of the UHC Bill into law, and the subsequent crafting of its implementing rules and regulations.